Rocky Patel's silky Decade cigar is a blend 10 years in the making. 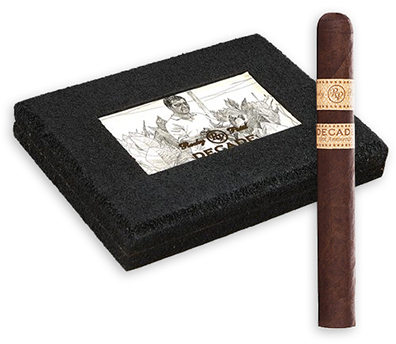 The Decade showcases a dark Sumatra wrapper surrounding a secret blend featuring only the finest tobaccos in the world. The result is a rich and toasty medium- to full-body smoking experience. Complexity, balance, and elegance earned the Rocky Patel Decade cigar ratings of 91, 92, 93, and 95 points - an instant classic.